After 11 months, we finally got our oven back functioning. 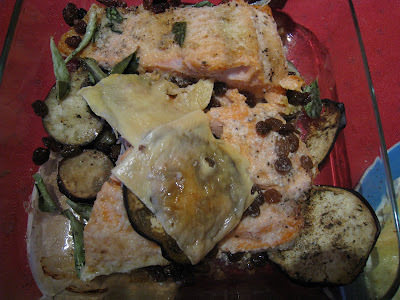 I realized that oven is such a nice cooking tool, that you just have to put everything in a baking dish and then you are free to do other stuffs. Very different from the Asian cooking, where you have to constantly stir, fry, cut, chop while cooking. Before moving to France, each time I came for a short term visit, I was amazed how my MIL can just sat with us chatting and managed to prepare baked dessert for every meals. The magic of oven solved the misery. Now I wonder how much time my mother missed busying in the kitchen while the others already started eating or buried in the conversation. is that an egg on the pizza? tot that is an australian thing. Your hubby is such a good cook! You're so lucky. 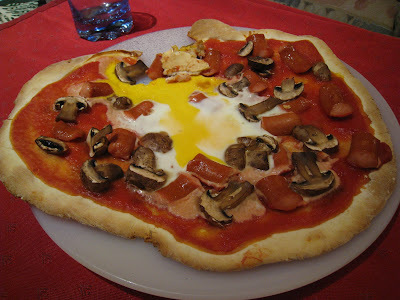 I haven't seen an egg on a pizza before, interesting, is the egg cooked? 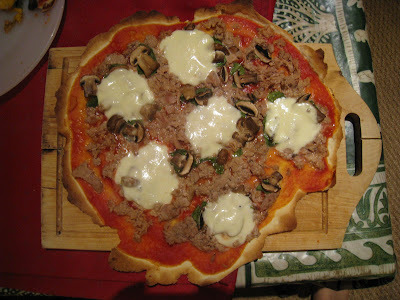 There is no limit for the ingredients on Pizza, at least at our home. I love egg so I asked hubby to put one for me. If not, French don't eat much egg, they said it is unhealthy. They are only allowed 2 eggs per week. Considering all the cheeses they consume who later transform into protein, I'm not surprised. Yes he is a good cook.